The book, New Birth – Pathway to the Kingdom of God proposes answers to some of the big questions of life. These include life’s purpose, potential, continuity after death, and salvation. Drawing on the Bible and other sources, the book focuses in a fresh, non-traditional way on what Jesus meant when he spoke about another birth, what it means in this life and the next, and what we can look forward to in the Kingdom of God. Most Christians believe that man is by nature sinful – following the rebellion/fall of Adam and Eve. According to traditional teachings, this condition can be remedied by accepting Jesus Christ as a personal savior and his sacrifice on the cross as payment for our sins. This is said to reconcile us to God and cleanse us from all sin. The Bible, in the New Testament, indeed contains the teaching that man is saved by the death and blood of Jesus. While churches also usually teach that those who in this life have not accepted Jesus as their savior will eternally suffer in an ever-burning hell, the Scriptures are not quite as explicit – though they do speak about judgment. Besides numerous passages speaking about being saved by the vicarious atonement of Jesus – his shedding of blood and dying on a Roman cross, there is also another thread or “gospel” running through the New Testament. It emphasizes more of what Jesus taught and exhorted his followers to do, than what he did for them through his sacrificial death. Many passages speak about the Holy Spirit as the agent of transformation and creating the “new heart” predicted by Old Testament prophets. Jesus spoke about “New Birth” as a means of salvation and condition for entering the Kingdom of God. Other passages speak about Love of God shed abroad to our hearts by the Holy Spirit. We are to follow the leading of the Spirit in order to be saved. God is more than happy to give us the Holy Spirit, but our effort and cooperation are also needed in working out our own salvation. This book focuses on what is the New Birth, how we can be born again, what it means in this life, and what we can look forward to in the next life and in the Kingdom of God that Jesus so often spoke about when he came to the earth. It is a well-established fact (though not accepted by all Christians) that the Bible is not a book wherein every word is inspired by God. It is not a book of science or history as such. It also combines multiple threads of thought from various ancient sources. It has gone through a complex process of document selection, compilation, editing and reediting, as well as translating – all this long after the time of Jesus and the original apostles. There is no doubt that the Bible is an inspired book which has changed countless lives over the span of its existence, and that it contains the essential message of salvation. However, it is not free from errors, interpolations, extrapolations, and biases of its contributors, editors, and translators who were all influenced by the time and culture they lived in. Several years ago, I was led to another revelation – not as well known, but, I believe, worth considering. It is a collection of inspired/mediated writings received by an American medium, James Padgett, about one hundred years ago. When I began reading these messages, they made sense. My rule of thumb for discerning truth is how it resonates with me and my experiences – regardless of what the source is or who said it. I believe that inspired truth can be found in all the main religions and many other spiritual writings. It is important to realize that all inspired knowledge is mediated knowledge – it comes from a higher source beyond us through a human spiritual teacher (who in that process functions as a medium) to be passed onto others. In this book, I am mostly drawing on information from two sources: the four volumes of True Gospel Revealed Anew by Jesus (TGRABJ) published by the Foundation Church of the New Birth, and the Bible. I hope and pray that readers will, with an open mind, consider the presented views and decide whether what they read resonates with them. May they be inspired and encouraged, as well as motivated to act on what they learn, so that they can start on the journey of fulfilling their unlimited human potential. 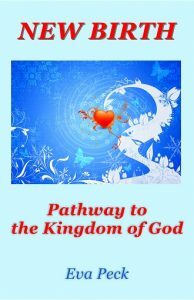 Australian readers may find a better value for New Birth – Pathway to the Kingdom of God at Fishpond which sells discounted books and delivers them postage-free. If you wish to learn more after reading , go to my website, Universal Spirituality.